Return on Impact hands leaders the tools that associations and other membership organizations can wield in order to harness the opportunities of the socially enabled world and ensure their growth in the coming times. David Nour charts the implications of a socially enabled world and the reinvention - in structure and governance, talent acquisition, listening practices, and business and revenue models - that leaders of organizations must undertake to fuel growth in the next decade. How to quantify the outcomes of social media and social collaboration. 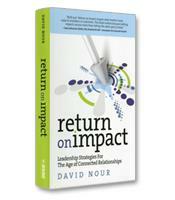 How social impacts every employer, customer, organization and leader. How your involvement online impacts your financial results. How to navigate the social space and drive quantifiable impact. How to think and lead differently because of social.